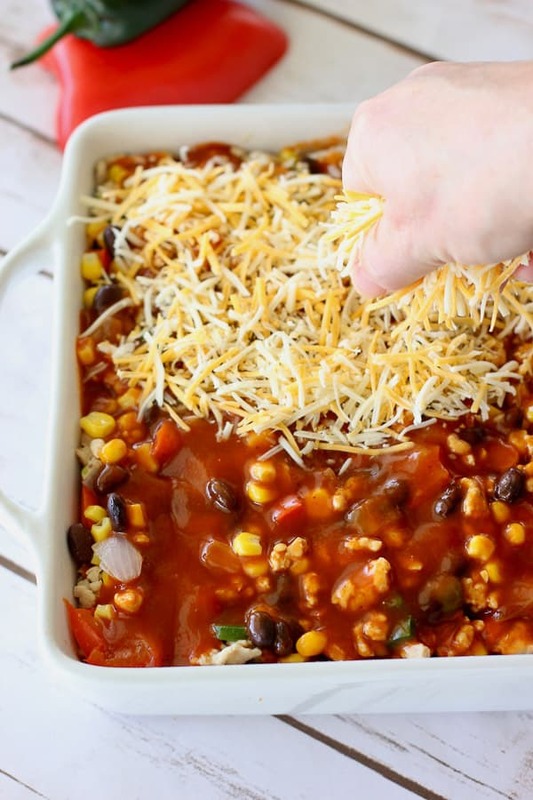 This 30 Minute Healthy Mexican Casserole is full of fresh veggies, lean ground chicken (or turkey), beans and just a bit of cheese to make it irresistible! When that craving for mexican food hits ya but your waistline is saying no no no! We are here to say yes yes yes! Clocking in at only 230 calories for a huge serving you are will love this delicious and filling meal! 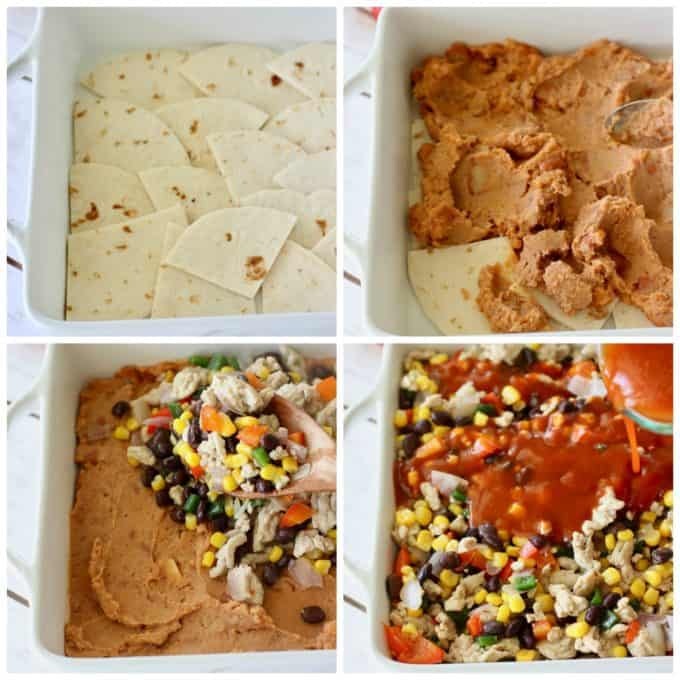 This recipe was inspired by one of my childhood favorites Taco Pie…made with refrigerated crescent rolls for the crust. You guys ever have that? So good but so not good for ya. I actually liked this one better! The veggies stay crunchy and there is a ton of texture to it. All those veggies make me feel soooo healthy! 1.) Layer quartered flour tortillas on bottom of 9 x 9 pan. 2.) Spread refried beans on top. 3.) Top with cooked veggies and lean ground chicken (or turkey). 4.) Pour on the enchilada sauce. Sprinkle with a bit of cheese and in the oven it goes! 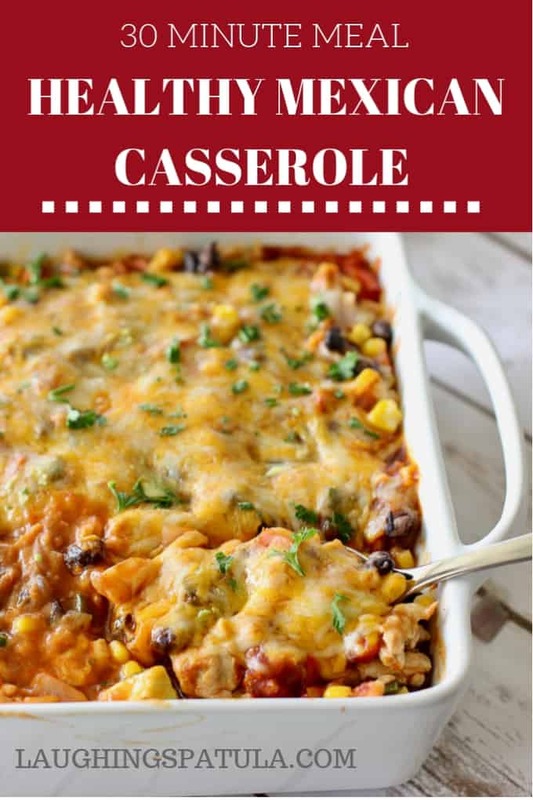 15-20 minutes in the oven and you get a super big flavored casserole that won’t break the calorie bank! I love to serve the leftovers over crisp cold lettuce. ..instant taco salad for my lunch! Even better? We got a video to help you make this with ease- check it out here! More Easy and Healthy Mexican inspired recipes? 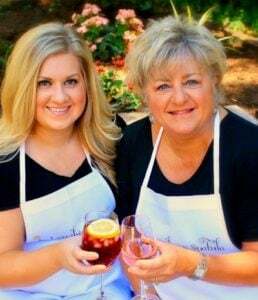 Here are a few of our faves! 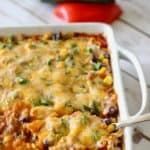 Lazy Day Chicken Enchilada Casserole – Easy on the cook recipe with those big Mexican flavors you crave! Or these popular Chicken Fajitas! Everything onto a sheet pan, bake and done! 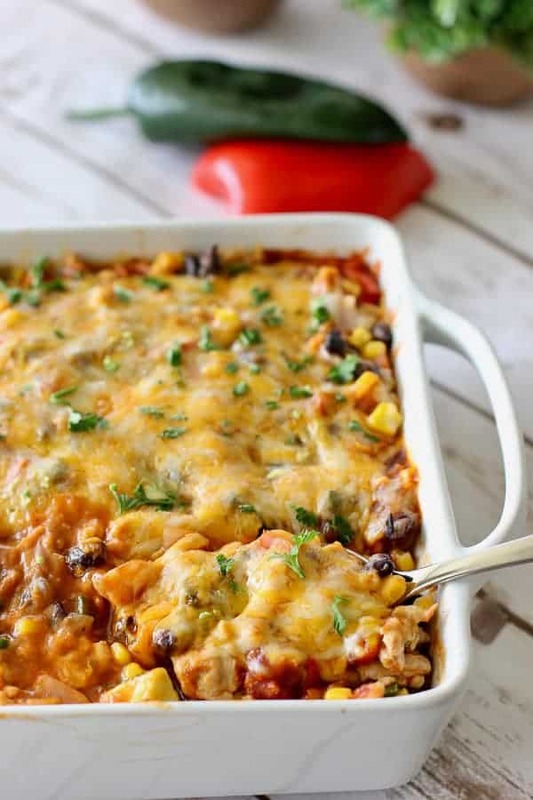 To Healthy and Easy Meals with tons of Flavor…Mexican style! Preheat oven to 375 degrees. In large skillet heat olive oil. Brown ground chicken, breaking up into small pieces as you go along. Drain any excess liquid. Add chopped peppers and onions to browed chicken and cook until softened but not overly cooked. About 5 minutes. Add corn, black beans and spices. Heat through. Spray a 9 x 9 inch baking pan with non stick spray. Line bottom of pan with quartered tortillas. Put the refried beans in a small bowl and heat in the microwave for 30 seconds. Stir to soften. Spread on top of tortillas. Add cooked meat and veggies on top of refried beans. Pour enchilada sauce over the top. 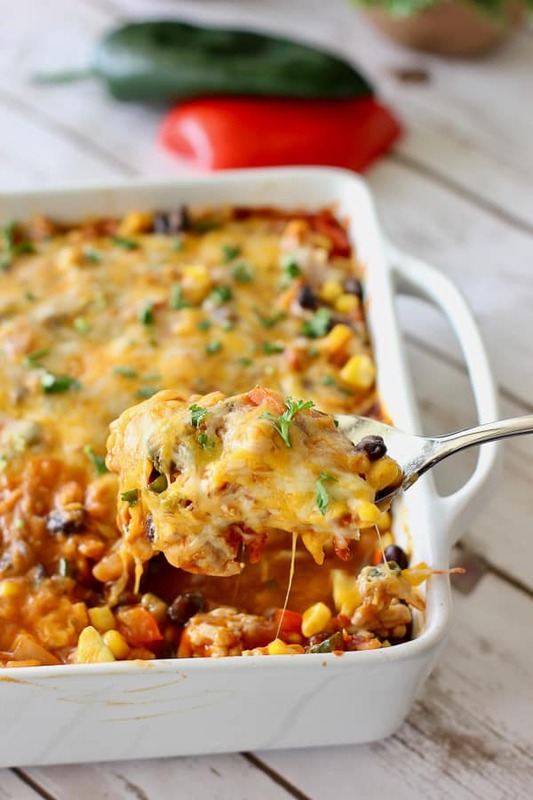 Sprinkle with cheese and bake for 15-20 minutes until hot in the middle and bubbling around the edges. Serve with fresh avocado and sour cream. Use ground chicken or turkey. Leftovers go great over fresh crisp lettuce for a taco salad! I want to make this in a 9×13 portion because I have a big family. Usually in a recipe like this I would leave the meat portion the same but double the veggies. I was thinking of only doubling the fresh veggies, not the refried beans, meat or tortillas. The way you prepare it the results seem on the wet side, do you think it would be too dry if I only did the 10oz enchilada sauce or should I go bigger? Thanks for the help! Hi Sara – I don’t find this on the wet side at all so I’d probably increase the enchilada sauce by 5 ounces. Keep in mind I have not tried it! Hope you love it! Wow thank you for the rave review Reg! Truly appreciate all the xoxoxo’s! Add roasted poblano peppers and you will be in heaven. Love this! Super easy and looks delicious! Thanks Karly! Hope you get a chance to make it!